I just stumbled upon your website a few hours ago and I must say that you are amazing. Your works are inspirational to me. You and Trey Ratcliff (stuckincustom.com) are my photography heroes. Neat find. I find the pastel colors interesting. Not usual for wall art. Great find! Love how you've framed this...and especially love the color and light. Striking image and wonderful bold colors. Very nice! Love the lighting in this box-like room. Of course, the colors are great. It look painterly almost to me. What a great find. I really like the way you have framed this. Also the light and the soft colors appeal to me. Good composition with these colours and the lighting. son xulus els graffitis, m'agraden els colors...que és.........un garatge??? Great spatial depth to this photograph. Fascinating usage of colors and light too. Awesome shot and perfect title! Strange and interesting process. 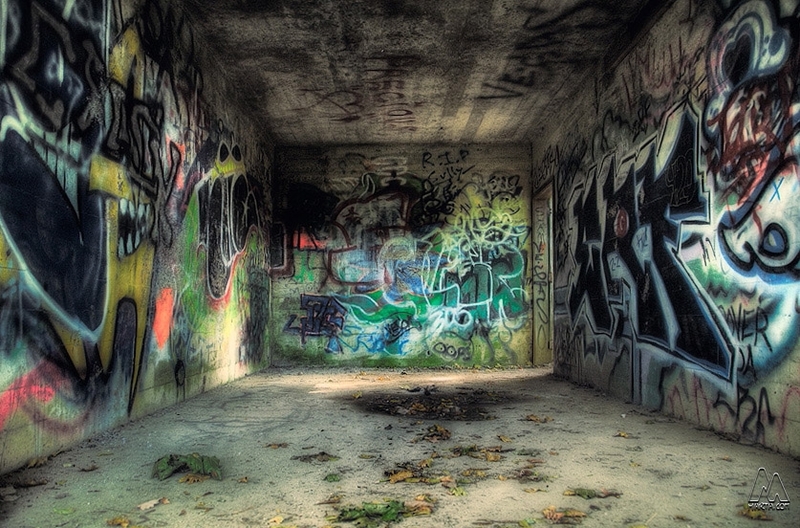 We're used to see graffiti with vivid colors and strong contrast. Beautiful play of lights! Lovely find and great captured! Hi Marta .. das sind ja ganz neue Seiten ;-) .. ist da ein wenig Photomatix im Spiel? Gefällt mir gut, die Weichzeichnung tut dem Bild sehr gut!! Els grafitis són curiosos, em provoquen de vegades interès estètic i alhora un cert rebuig ètic. Realment aquesta nau que vas trobar és interessant!! Una abraçada. Artistic roughness! great shot, love it. What a neat shot - taggers' playhouse. Very cool shot, great colors. very nice image! the letters, as if would light. so, great! Your processing has really made the graffiti pop in this one! Nice work! Exceptional processing to get this wonderful result! Great photo! The hdr effect is masterfully done, good selection of the scene. Fascinating capture of this amazing graffiti. Excellent frame and perspective. Bon dia. He fet una ullada al teu fotobloc i t'he de dir que l'he trobat molt bo. La diversitat de fotos i colors li donen un aire super sulo. Your title says it all just perfectly. As if one has just found themselves at the bottom of a box of crayons.